Rep. Jeff Currey, left, listening to Rep. Kelly Jules-Scopino, whose home has a crumbling foundation. The speeches were unusually urgent, even raw. 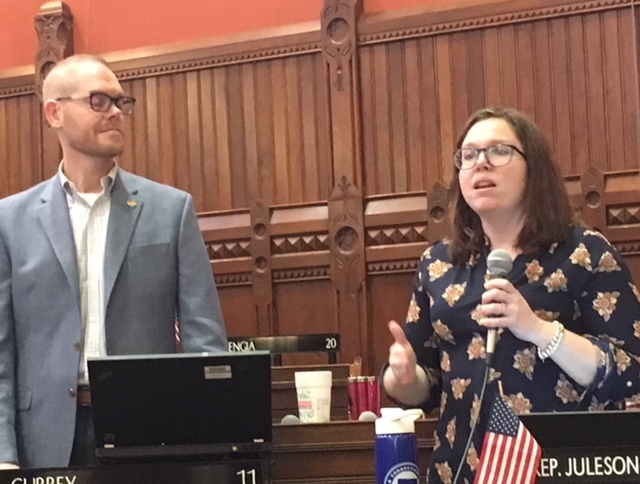 One after another, lawmakers rose Saturday in the House of Representatives to plead for help with what they say is a disaster in slow motion: crumbling concrete foundations that are undermining homes, marriages and the tax bases of communities throughout eastern Connecticut. They talked about the American Dream turning nightmarish, homes rendered valueless or even uninhabitable, their foundations containing aggregate from a Willington quarry contaminated with pyrrhotite, a naturally occurring mineral that corrodes and causes massive cracking when exposed to groundwater. The House responded with a 97-42 vote in favor of a bill that would impose a $12 annual surcharge on homeowners’ insurance policies, contributing about $9.3 million annually to a relief fund for residents facing complicated repairs costing as much as $250,000. 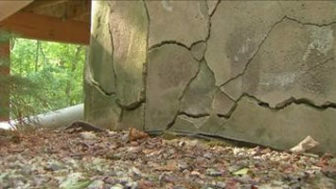 Affected homes must be raised, allowing the removal and replacement of the crumbling foundations. Insurance companies have refused to cover the damage. The federal government has dispatched the Corps of Army Engineers to study the phenomenon, while refusing to provide disaster relief through FEMA. The state budget approved last fall authorizes the borrowing of $100 million over five years for relief, but the damages are expected to cost billions. “We still don’t now how big the problem is,” Delnicki said. 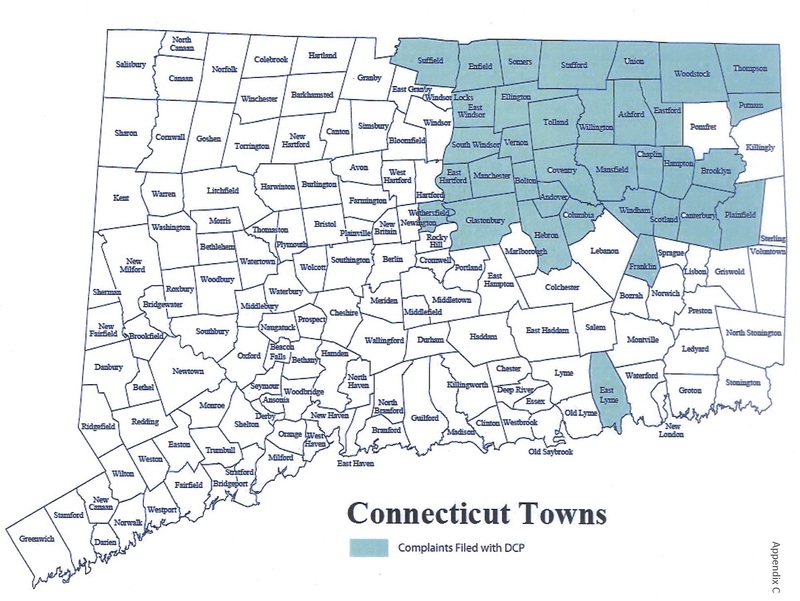 Rep. Jeff Currey, D-East Hartford, one of the lead sponsors of the surcharge bill, said the goal is to provide a second and sustainable source of funds. Sustainable is a relative term, however. The surcharge will last for only 10 years, unless it is reauthorized by the General Assembly. Claims against the relief fund will be evaluated and paid by a captive insurance company created by the state. To broaden support for the measure, its potential beneficiaries were expanded. The original proposal called for a $10 surcharge on the state’s estimated 900,000 homeowner policies, raising $9 million for crumbling foundations — all of it going to crumbling foundations. The revised version would impose a $12 surcharge, with 15 percent of the proceeds going to remediation for homes with radon and lead paint, as well as to those in a New Haven neighborhood where some houses are sinking. Democrats voted 72-1 in favor, the sole dissenting vote cast by Rep. John Hampton of Simsbury, a suburb outside the disaster zone. Republicans voted 41-25 against, with most — not all — of the support coming from representatives of the 40 affected communities, covering roughly the northeastern quadrant of the state. Some of the opponents were blunt. Rep. Rob Sampson, R-Wolcott, said no one in his district was affected, leaving him unable to justify a vote for the plan. Legislators from the affected communities said the impact on their constituents was financial, physical and emotional. Rep. Mike Winkler, D-Vernon, described the odd sight of a condominium complex in his district emptied and suspended on temporary supports while the foundation is replaced. “Can you imagine sleeping when you know the foundation beneath you is crumbling?” he asked. Rep. Gregg Haddad, D-Mansfield, said one of his constituents is a retired teacher who found the price of saving her home will be $226,000. “This is not a problem, this is a crisis,” said Rep. Kurt Vail, R-Stafford. Rep. Kelly Juleson-Scopino, D-Manchester, rose to share a story known to only some colleagues: Her home’s foundation is crumbling. The dream house she purchased for $300,000 in 2012 is now valued at $86,000. The surcharge amounts to $1 month, or pennies a day, she said. When the roll call began, Delnicki visibly tensed. When the tally was announced, he relaxed. “You get the idea there is some emotion with this,” he said. Currey came over to shake his hand. Delnicki embraced him.